It was serendipitous, Eric Schorr’s connection to Japan. Without having prior knowledge about the culture or a strong desire to see the country, Schorr, a New York-based composer and lyricist, accompanied a friend on a whim. Schorr was “blown away” by the people he encountered and the culture he experienced there. Upon returning to New York, Schorr fueled his newfound passion for Japan by watching Akira Kurosawa’s black-and-white, post-World War II movies and taking language classes at Japan Society. Now, ten years after that first trip to Japan, Schorr is three weeks away from seeing his new musical, Tokio Confidential, hit the stage. The play is a result of years of research and writing by Schorr, who also composed the score for Frog Kiss and The Doctor’s Wife. With Tokio Confidential, he blends his interests in a variety of aspects of Japanese culture – particularly ukiyo-e and Noh – to tell the story of a woman who travels from America to Japan in search of lost love. Schorr set the play in the year 1879, during the Meiji Era and 25 years after Commodore Perry sailed through Japan’s isolation. Wanting to present a modern face to countries in the West, Emperor Meiji banned tattooing for Japanese nationals, declaring the practice barbaric. However, the ban didn’t include foreigners. Enter Isabella Archer, Tokio Confidential’s protagonist, a Civil War widow whose husband had business dealings in Japan and spoke fondly of the country. Still having difficulty dealing with her grief 15 years after her husband’s death, Isabella takes the long journey from San Francisco to Japan in search of her husband’s spirit. What she finds is an amazing world of beauty through the work of a famed Japanese tattoo artist, and she decides to get a full-body tattoo, transforming herself into a ukiyo-e woodblock print. In the process, she falls in love with the artist as his artwork brings the color and personality back to her life. When Schorr began writing Tokio Confidential more than five years ago, he received a grant from the Asian Cultural Council. The fellowship allowed him to live in Tokyo and travel throughout Japan for nearly four months, and he immersed himself in researching the time period and attending Noh plays. 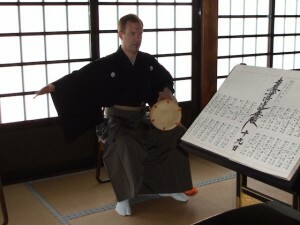 He later returned for a Noh writing workshop, as he wanted Tokio Confidential to have a similar structure, theme, and musical elements as Noh theater. With Tokio Confidential, Schorr wants to appeal to a wide range of audiences from people who already have an appreciation of Japanese culture to those who are unfamiliar with the country, as he was ten years ago. He is also curious to see how the Japanese community in New York reacts to an American’s interpretation of Japanese culture. An American who pays homage to a culture he loves with his labor of love. Tokio Confidential runs from Sunday, February 5 through Sunday, February 19 at Atlantic Theater Company Stage 2 located at 330 West 16th Street (between 8th and 9th Avenues). Shows times are 8:00 p.m. Wednesday through Saturday with matinees at 3:00 p.m. on Saturdays and Sundays. Tickets are $45 and can be purchased at ticketcentral.com or by calling 212.279.4200. For more information, visit TokioConfidential.com. Previous Previous post: Japan Society is Abuzz with "THE BEE"